3D printing is helping in this mission by emerging as a resourceful solution to many military needs. Two examples of 3D printing use at the forefront of such efforts are currently being used by the U.S. Marine Corps and the U.S. Navy. The U.S. Army Engineer Research and Development Center in Champaign, Illinois has the world’s largest concrete 3D printer. The U.S. Marines are using it to build one of the largest concrete barracks structures in a collaborative effort between the Marine Corps, Army and Navy Seabees. The mammoth printer was used to actually print a 500-square-foot barracks hut in 40 hours. The U.S. Marine Corps builds a 500-square foot concrete barracks using 3D printing in 40 hours. Remarkable of their accomplishment was that the barracks facility was built onsite and in one evolution. They used a CAD model, materials (concrete) and a 3D printer. While the entire operation took 40 hours, they expect this time to be shortened if robotics can be employed to do the mixing and the pumping of the concrete, which would have added significant speed to the operation. They believe it could have been completed in one day. For the Marines, the use of robotics in combination with CAD and 3D printing technology is an exercise in strategic defense. Construction, automated with technology, builds structures that take a Marine out of harm’s way in a battle theatre, freeing up time, space and protecting them from danger. With this in mind, the Marines have an additive manufacturing team, specifically focused on new ways to improve the total effort for Marines as they prepare for combat and missions. They tout this accomplishment as significant. Historically, the Marines are quite adept at providing food and aid, but have struggled to provide adequate shelter in the field. Traditional means of providing shelter have turned to wood and materials and they believe concrete is actually a more convenient medium for many locations. It would also allow them to exercise humanitarian missions and 3D print everything from houses to schools and other edifices – particularly when previous ones have been destroyed by disasters or crisis. It’s not just the Marines who are using 3D printing to create structure. The Navy is using 3D printing to create structure as well, only for a very different application: air frame repair. Ordinarily when an aircraft is dented or damaged and requires repair, the damaged areas is bored out and a structural honeycomb shape is inserted to match the original construction. Epoxy is then poured over the exterior bore. The liquid applied epoxy, however, seeps into the structure making the repair difficult and adding unplanned weight to the aircraft. The U.S. Navy has begun 3D printing plastic plugs as a replacement for the metal honeycomb sheets currently used to patch any damage in an aircraft’s surface. 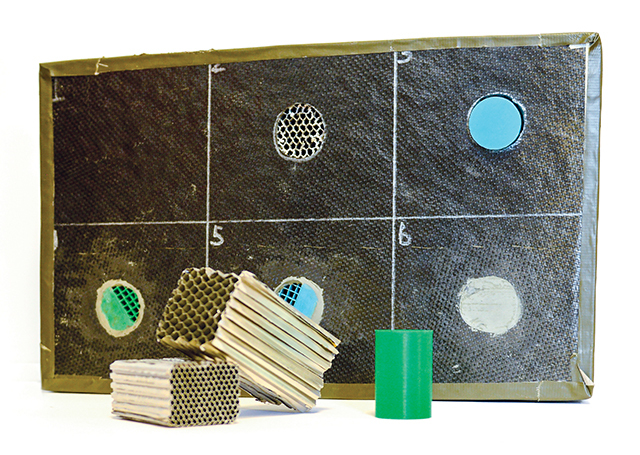 The Navy are now developing 3D printed plastic plugs to produce the honeycomb structure. The 3D plug will contain hollow cells arranged in the same honeycomb pattern, but not susceptible to the same seepage of epoxy as the traditional repair method. This new and innovative method uses less epoxy, but also reduces the level of effort as it eliminates much time that would have normally been spent fabricating the honeycomb material to fit the bored holes. With pre-cut plugs, designed to fit standard hole saws, the new plugs could do the job in record time. Of course, with 3D printers at the ready, they could always fabricate more. The application of 3D printing for military and defense applications has so many uses – many that are yet to be developed as the technology makes its way into the channels and daily lives of soldiers, sailors and airmen around the world. While defense manufacturers can, will, and do use 3D printing in their complex manufacturing, the goal is self-sufficiency provided by 3D printing. With technology they can take care of themselves and others; 3D printing is a boon to specific military needs in most every part of their operations and missions. In the future, we can only expect that such an embrace will grow significantly and new and innovative uses will be put to work.